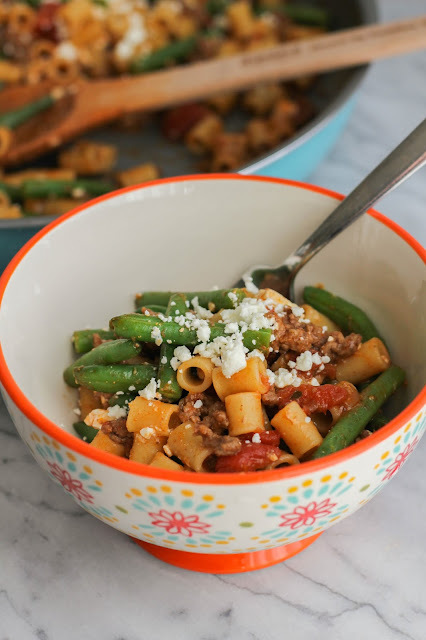 This One Pan Greek Beef Pasta is made in one skillet and can be on your table in less than 30 minutes! 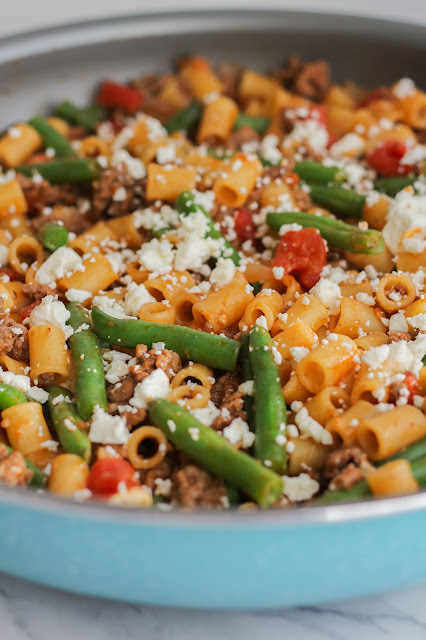 It's quick, easy, and full of delicious flavors that your whole family will love! There's nothing better on a busy weeknight than knowing you don't have to worry about dinner. To have all of the ingredients on hand for a quick and easy one pan meal is a blessing. I've learned over the years that dinner doesn't have to be complicated. 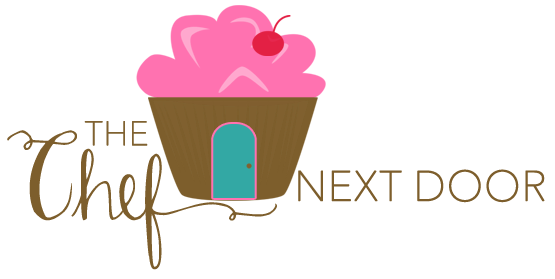 It's all about using the best ingredients to make one heck of a delicious meal. 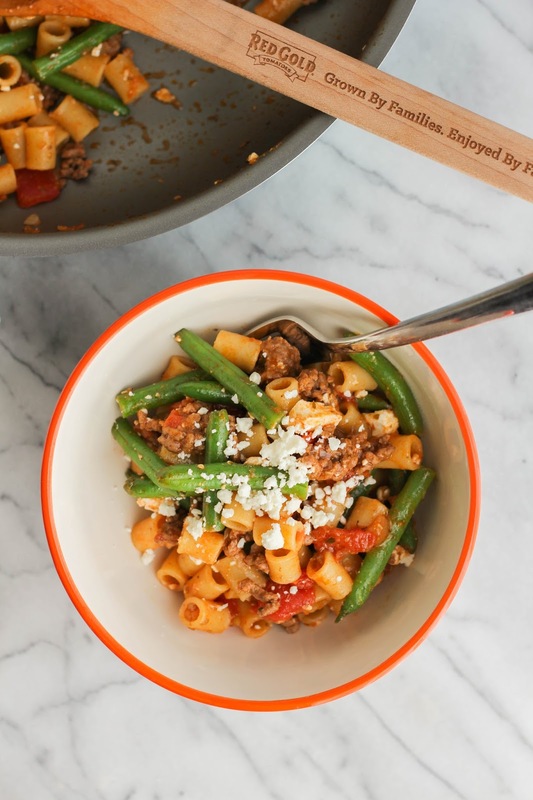 This One Pan Greek Beef Pasta is just that! 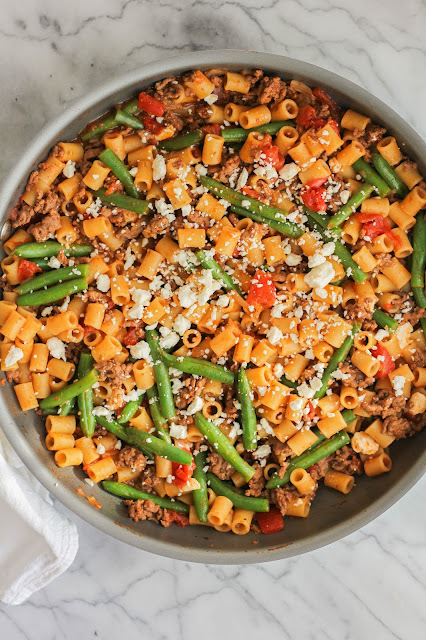 Lean ground beef, Red Gold tomatoes and fresh green beans are the stars of this easy one pan meal. Oh, and you can't forget the cheese. Delicious feta cheese to be exact. It's the simplest of dinners, but one that my entire family absolutely loves. I love using Red Gold products in my dishes. 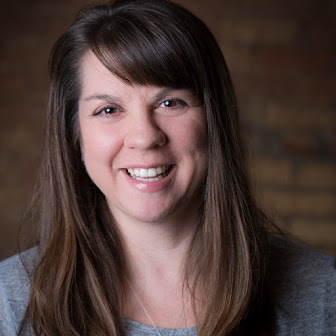 I was lucky enough to go on a tour of their headquarters last year that also included visiting a few of their processing plants and a tomato farm. It's absolutely wonderful to see behind the scenes and know exactly how the tomatoes get from the farm to the store. Red Gold is the first major canned tomato brand to be certified non-GMO, and every can has a non-BPA liner. They also recently redesigned their labels, making it easier to find the information you want about what’s inside each can. I don't know about you, but what's inside that can is very important to me! I use Red Gold Roasted Garlic & Onion Diced Tomatoes in this recipe, which I think adds the perfect flavors to this delicious dish. Do you have a favorite dish using canned tomatoes? Share with me in the comments below! So who's ready to get cooking? I know I am! Cook the ground beef and diced onion in a large skillet over medium-high heat until the beef is browned. Drain off any fat, if needed. Add the oregano and pepper and mix well. Add the tomato paste and stir it around to coat the meat. Stir in the broth and diced tomatoes and bring to a boil. Stir in the pasta, then reduce the heat to low and cook for 10 minutes, covered. Stir in the beans and half cup of the feta cheese. Cover and cook an additional 10 minutes until the pasta is tender and the beans are warmed through. Sprinkle with the remaining feta cheese, then serve.